Well 2012 is over and I accomplished my goal of making cookies for all 37 n/n's. While I was doing that I had a sibling or two say "hey maybe you should do them for your brother/sister". So since I only have 8 of those I think I can handle it. Drum roll...... first off for 2013 is McKay. McKay is one of my 5 brothers. He is the closest to me in age just 2 1/2 years older than me. I sure do give my McKay a hard time. We may not have been best friends growing up and he may have been mean to me but I am not going to air all our dirty laundry out here. I just want to say that even though we were not best friends while we were in high school together we have become really great friends and closer ever since. I look up to McKay, not just physically he is 6'5", he is a great example to me. I want to be like him. 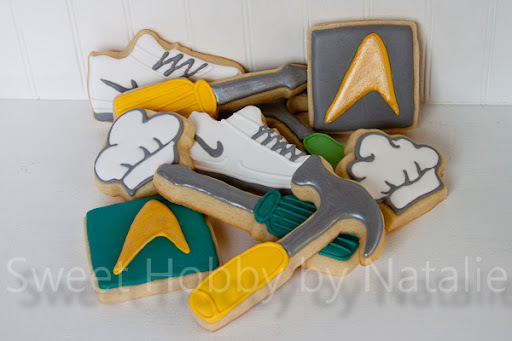 He is smart, good looking, in shape, amazing cook and baker, and a awesome handy man. Some day I will grow up to be just like him. He can do anything, if he doesn't know how to do it he can figure it out. I think he can even sew! I am so grateful for him he is always helpful to my family. My husband, sorry honey, is not a handy guy and since my brother is so dang nice he has helped us finish a basement in our first home and he turned our family room into another bedroom (with the help of my nephew John) and our play area/downstairs family room into a home theater. I am kinda sad that he got a new job and will not be working only 5 minutes from my house. I will not be able to bug him to come over on his lunch break to give me home improvement help. :( But I am glad he does not have an hour commute anymore either. One thing I remember about McKay is his love of Star Trek. Not sure if he was bored on Saturdays in the small town that we grew up or if he truly is a Trekkie. I think that later is true. :) He could be found watching the old reruns of Star Trek on any given Saturday in our home. But he equally likes the other additions of the franchise. 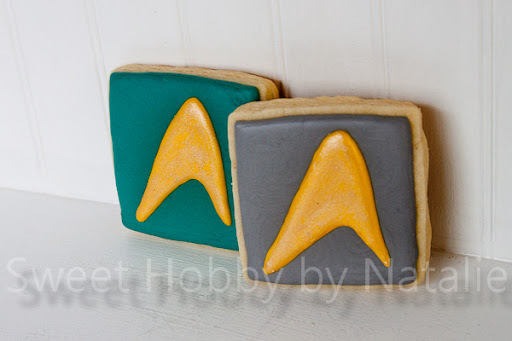 So I made a little Trekkie cookie for him. 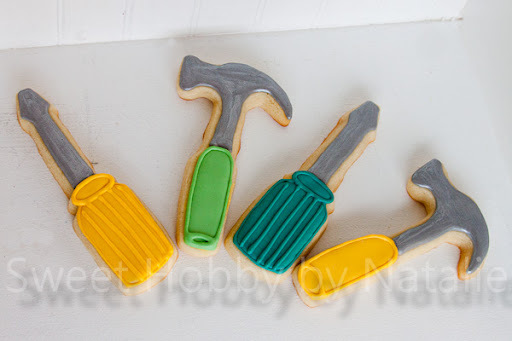 An of course I said he is one handy guy, so tool cookies were in order. 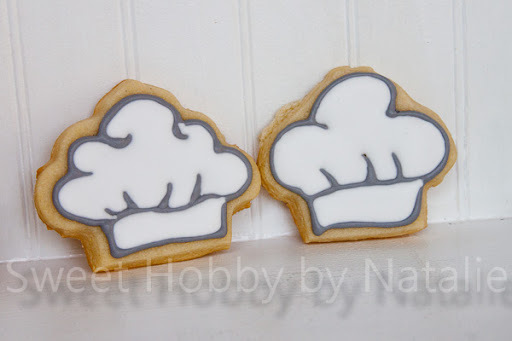 I wanted these to look like chef hats but they look more like a bakers hat, not sure if there is a big difference. I think our Mom did a good job in teaching and inspiring us all how to cook and I have always admired McKay's ability to be fancy in the kitchen or I guess you might say he has culinary skillz! I so wish that I had the drive that he has to be in shape. He is a exercising maniac, he rides bikes, runs, pretty sure he has done some thons, not sure which ones.... mara, triatha anyway he is in good shape. I am sure he would disagree he had knee surgery recently and has not quite yet fully recovered. 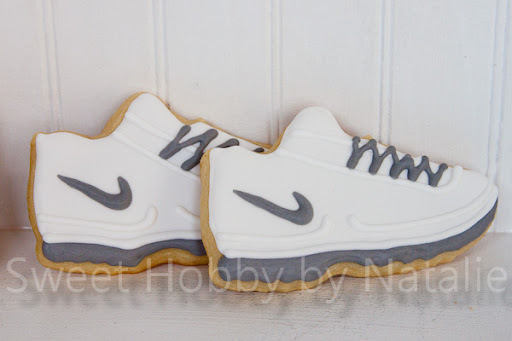 But I am sure as soon as he is back he will be lacing a pair of these.